Using data from three independent satellites to analyze the extent of surface melt over Greenland’s ice sheet, NASA and university scientists found that ice melting at or near the surface jumped dramatically this year with an estimated 97 percent of the ice sheet surface thawed at some point in mid-July. 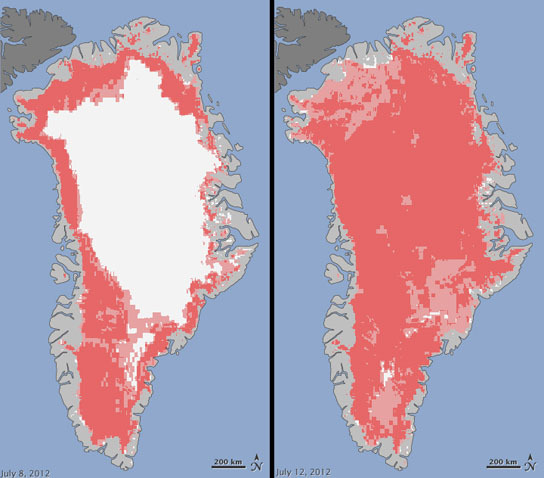 Pasadena, California – For several days this month, Greenland’s surface ice cover melted over a larger area than at any time in more than 30 years of satellite observations. Nearly the entire ice cover of Greenland, from its thin, low-lying coastal edges to its 2-mile-thick (3.2-kilometer) center, experienced some degree of melting at its surface, according to measurements from three independent satellites analyzed by NASA and university scientists. Nghiem consulted with Dorothy Hall at NASA’s Goddard Space Flight Center in Greenbelt, Maryland Hall studies the surface temperature of Greenland using the Moderate-resolution Imaging Spectroradiometer (MODIS) on NASA’s Terra and Aqua satellites. She confirmed that MODIS showed unusually high temperatures and that melt was extensive over the ice sheet surface. Even the area around Summit Station in central Greenland, which at 2 miles (3.2 kilometers) above sea level is near the highest point of the ice sheet, showed signs of melting. Such pronounced melting at Summit and across the ice sheet has not occurred since 1889, according to ice cores analyzed by Kaitlin Keegan at Dartmouth College in Hanover, New Hampshire A National Oceanic and Atmospheric Administration weather station at Summit confirmed air temperatures hovered above or within a degree of freezing for several hours July 11 to 12. Be the first to comment on "Satellites Confirm Extensive Ice Sheet Melt in Greenland"